Alton Towers wooden roller coaster in 2008? Remember we said something big was planned for 2008? It was revealed last weekend that Alton Towers may finally be poised to install a long-awaited wooden roller coaster in 2008. The news was announced during the RCCGB's annual trip to the park. 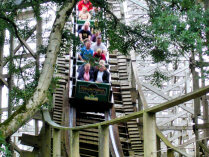 The woodie, which planning permission has not yet been sought for, would be in a similar style to the extremely popular wooden coaster Megafobia at Oakwood theme park in Wales. Previously, the park had applied for permission to build a giant wooden coaster that would have dropped down one side of the valley between Ug Land and the Forbidden Valley, and then up the other side, before doing a return journey. These plans were submitted to the local council but later withdrawn before they had been given or denied permission. It is believed that the new plans are for a smaller scale woodie, possibly sited around the Ug Land area of the park. Get at least one ride photo as a great memento of your visit.